I hope you all had a wonderful weekend. Today’s page leads us to what I’m sure most of you have figured out by now this week will show. For those that can’t wait until I show what’s coming…you can check out a sneak peek of the 3D version of last week’s incentive. Again. I don’t normally do these incentives. But the timing was right to offer you guys the sketches last week. And today…the 3D models. You may also have noticed that there is NEW MUSIC today. I figure every Monday I’ll update the 5 songs. Just for fun. The first song is technically from the 80’s. But I saw Colin Hay sing it on Scrubs…this Acoustic version…and I fell in love with the song all over again. Song Number 2 is just I think a “throw away” song at the end of Jason Mraz’s first album. But driving in your car and listening to it…it’s a really cool song. And how can you not have Silent Lucidity playing when you think of Dreamland. Just listen to that song. So cool. Easier to Be is on Lifehouse’s newest album I think. It just stood out from the other songs and I really like it. And believe it or not…I found the song Around the Bend from that Iphone commercial. Ha ha. Sorry. Anyways. Laugh at my music tastes. But I hope you still enjoy it. Also…I’m trying to figure out a way to make the jukebox its own frame so you can listen while reading. If anyone has an idea on how to do that (that I can understand)…I’m all ears. Hope you have a great day…and thanks for reading (and listening). Probably parents with no imagination, I saw it happen to my friends. Boy I’m glad for my parents. My mom still maintains she believes in Santa Claus, even though her kids are are grown up. It was nice growing up in a home where imagination was valued. I actualy didnt expect that. She Admited without the sword that dreamland is real! Baby Felicity is Adorable. I cant wait until you put that page in the comic. OK, I’m hooked. Really great visuals and story!! I kinda expected something like this. I also can’t shake the feeling that there’s some kind of connection between Nico and Daniel’s inability to dream… ever notice that the curls in Daniel’s hair look like horns? ….reaches out to hug Nicole.. I know hun, they take your dreams and tell you they are not real. Then they tell you to grow up, that there is no room for dreams in this world of reality. Remember them, dear girl, remember them now before they are gone forever. Scott, you have made me cry at work, and on a Monday no less. I am not sure if I love you or hate, but please do not stop now. Man…just when you think it can’t get any better…it does! Poor Nicole. I wonder if it was Nicodemus who took her away. No wonder she stopped dreaming about Felicity and Dreamland. probably the parents took her to a shrink and they convinced her that it all wasnt real, thus “taking” it away from her…. darnit man im addicted to this comic, imma definitely buy the book….when it comes out. I actually goofed. There was supposed to be a page before this. With Nicole contemplating and such. Just letting it sink in. But I accidentally skipped it. Ack. But looking at the pages…we don’t seem to miss it. So…you guys just skipped ahead. And the 3D kiddie Fel+Nicole are SUPER CUTE! this keeps getting better & better… thank you!!! The incentives are great models, Scott! The Chibi Nicole and Felicity are face pinching cute! Scott, if you want to get technical, the SONG at #1 is from the 80s, but the recording is from the current decade (the pre-teens, as I like to call it). It’s from Colin Hay’s 2003 album “Man @ Work,” which is basically him doing covers of his old band’s song. Great album. No. I think it works fine without the page. If I have second thoughts…I’ve already rendered the panels…so making the page wouldn’t be a big deal to put in if I think it flows better when putting Book 4 together. looking at it in Itunes now…you’re right. I should have researched it more…ha ha. Thanks. I never thought it could be her parents, but that’s a good idea. I have a sick feeling this will be a week of painful cliffhangers. Great panel, Scott! I was wondering, do we get to see a sneak-peek of the panels in the missing page, now that you’ve already rendered them? Fantastic story, great characters, wonderful setting. I can’t stop reading – and I just can’t wait to read the next page. Oh…the page that was supposed to be up today was a panel of Daniel staring at Nicole. For about 3 panels. 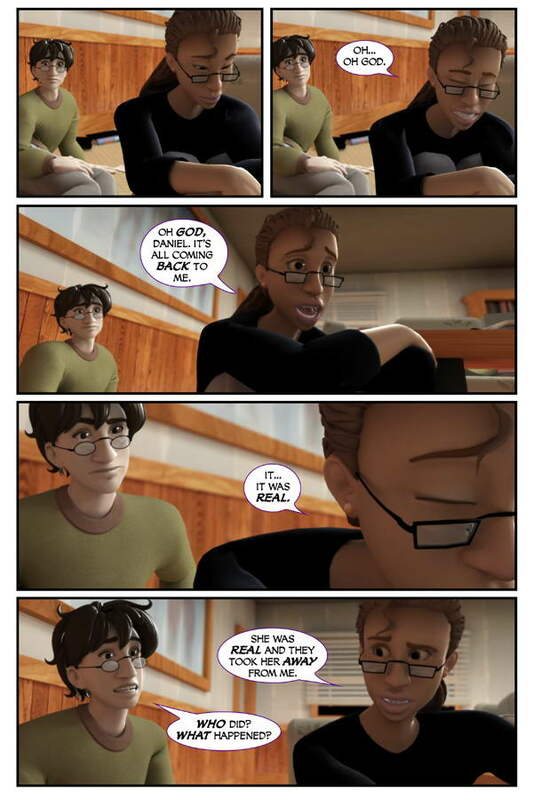 Then in the last panel she says “Oh…Oh God” as the realization hits her. Basically I moved that all to the first two panels of today’s page and hadn’t reallized it. So…it kind of makes the “missing page” useless. I’m guessing that Nicole was the victim of psychiatric treatments aimed at ‘curing her psychosis’. Or, perhaps, that she had a token to enter Dreamland (just like the sword) and that her parents took that away because she was ‘obsessing’. But most likely the former. well, that could be true… but joey doesn’t have a trinket, does he? not that i could tell.. but i swear, if the dragon took away the little kitty felicity… i will do all i can to try to hunt that )(*&)_(*( dragon and kill his red tail… but i just as well wait for alex to do it… XD. continue the walk down memory lane NICOLE!! Parents who want their daughter to be perfect and the best, so they would drill her toferget childish things and concentrate on what they thought would make her number 1. You guys are probably correct, but “they” might not be her parents or other guardians. They could be Dreamland authorities who locked up Felicity. Just because no dungeon can hold her for long now doesn’t mean that that was always the case. Tom may be on to something there…. Ahhh Yeah ….Here we go everybody! Yeah, when she said ‘they’ the first thing i thought of was someone in Dreamland. I guess we’ll see. … But I won’t. How sad is that? Here’s a reason to bring in the extra panels: Two pages ago, Nicole was still guarded about Daniel, even if she was almost ready to be playful. Now, with very little time to think, she’s telling him a secret whose meaning she hasn’t internalized. It doesn’t feel right. She needs a little time … and we need to see a little time … before she figures out how much she’ll tell him. Too much of who she is is out on the line. I think we broke Buzzcomix…ha ha. Thanks Njcommuter. It’s rare to hear someone tell me to add more pages. Especially of just thought and silence. It’s a pleasant surprise….ha ha. I’ll consider putting it back in again. Wow! I’m sorry I’ve missed out on the jukebox ’til now. I love this version of Overkill, Silent Lucidity has always been a favorite of mine, and I haven’t heard either in ages. Amazing that they are so appropriate – I had forgotten the lyrics.